I managed to get a lot done between the time I had joined the Order of the Twin Adder and when Minfilia finally contacted me again. She had another job for me, this time in Gridania. There had been rumblings that the Sylph, a plant-like beastman race, were possibly attempting to summon their Primal Ramuh. I was tasked with investigating the Sylphs’ intentions and determining if there was a Primal threat in Gridanian territory. Yda and Papalymo would be joining me as soon as they arrived from the Waking Sands. I was to report to Commander Vorsaile Heuloix of the Twin Adder to be debriefed. When I arrived at the Adder’s nest Commander Vorsaile gave me a quick rundown on the current situation with the Sylph. The beastmen tribe had once been allies with Gridania, going so far as agreeing to a pact of non-aggression. After the Calamity and the destruction wrought upon the Twelveswood, the Sylph had left Gridania and returned to their homeland deep in the wood. There they prayed to their Primal God Ramuh for support. Ramuh was a wizened Primal and not very confrontational and his first coming harbored no ill intent. However, reports were that the Sylph were attempting to summon Ramuh again for some reason or another. 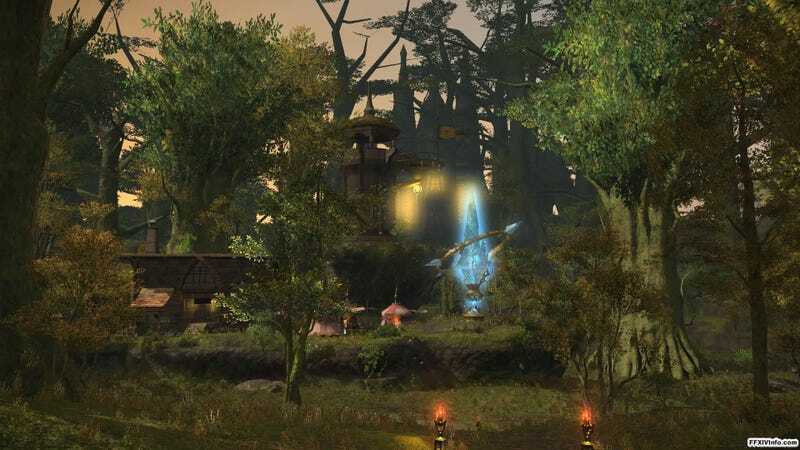 I would need to head to Little Solace, a small community where Sylph still interacted with the people of Gridania, and ascertain their intentions. I was instructed to stop by Hawthorne Hut and receive a briefing on Sylphic culture from an officer stationed there. I left the Adder’s Nest and went to Westshore Pier in the northern section of Gridania. Once there I took a ferry across the river and to the Eastern Shroud. I followed the road south east toward Hawthorne Hut. Along the way I passed Fullflower Comb, a large honey farm run by Rosa Hawthorne. She was busily tending to her many hives when she saw me pass. She hailed me down and I stopped to ask her if everything was alright. She told me that there were a number of invasive wasps moving in endangering her honeybee hives and asked if I could take care of them for her. I found it hard to refuse and went about the quick task of destroying the wasp hives. My reward for the menial task was a fresh jar of honey. With honey in hand I continued on to Hawthorne Hut. I found Serpent Officer Amelain at the encampment and asked him what he had known about the Sylph. He was tight-lipped at first until he saw my jar of honey. Apparently the officer had quite the sweet-tooth and was more than willing to trade information for the honey. I begrudgingly agreed and was told to seek the aid of Rolfe Hawthorne who was supposedly well versed in tales of the Sylph. I grumbled about the lousy trade and sought out Rolfe. Rolfe’s memory wasn’t quite what it used to be and he had issues recalling any important information on the Sylph. Luckily, whenever he did remember he was quite the talker and the other inhabitants of Hawthorne Hut had heard his stories incessantly. I spoke to his daughter and two passing sentries about the Sylph and was offered stories about the beastmen. The Sylph were known for being mischievous and capricious in nature, not quite understanding or caring about Gridanian propriety or etiquette. I spoke to Rolfe again and managed to jog his memory with the stories I had gathered from the others. Finally I learned something of use, that the customary form of greeting among the Sylph is dancing. Before I could head east toward Little Solace, Rolfe warned me that it would be rude to visit the Sylph without taking a proper gift. Of course the Sylph would want a gift. They had no problem ignoring Gridanian etiquette but gods forbid I don’t bring an offering. Rolfe’s memory was beginning to grow hazy once more and I returned to Fullflower Comb in hopes that his wife knew what would count as an appropriate gift. Rosa Hawthorne mentioned that Sylph loved an odorous plant called milkroot and told me where I could find it. I spent the better part of an hour searching out the plant, which was indeed noxious. I returned to Hawthorne Hut and asked Rolfe if the specimen of milkroot I had obtained would be enough and the smell seemed to jog his memory once more. He assured me that the sample I had gotten was more than satisfactory and gift-wrapped it so it would be presentable, however the smell still seeped through it much to my dismay. As I was leaving Hawthorne Hut, Serpent Officer Amelain approached me once more. He had just received a letter from the Elder Seedseer to be delivered to the Sylph. With letter and milkroot in hand I traveled east to Little Solace on the edge of the Sylphlands. Little Solace was nothing more than a small encampment of tents with few people and few Sylph. I was instructed to deliver the message to a Sylph named Komuxio who would be able to deliver it to the Sylph elder. The plant-like beastmen all looked very similar to me, but I managed to find Komuxio with relative ease. I spoke to the Sylph and explained that I had a peace offering and a letter for the Sylph Elder, but he was unreceptive. I felt stupid when I remembered that I needed to dance as the proper form of greeting. Feeling quite the fool, I began to dance as best I could. It must have been good enough because Komuxio’s attitude quickly changed for the better. The Sylph were difficult to communicate with. They referred to themselves as “these ones” and others as “those ones”. I myself had been upgraded from “walking one” to “dancing one” after my appropriate greeting. I gave Komuxio the milkroot and the letter, trying to translate the strange speaking patterns of those ones, I mean, the Sylph, in my head as the spritely beastman spoke. Despite my gift and the letter, Komuxio still seemed unconvinced that Gridania meant no harm to the Sylph and only wanted to open communication between one another once more. I was trying my best not to argue with the Sylph when we were approached by Yda and Papalymo. I discussed my problem with the two Scions and we began to brainstorm a way to get the Sylph to believe us. Yda, ever the pragmatist, suggested that I dance for all of the Sylph of Little Solace. I stared at her for a moment, dumbfounded. Yda, the one I had always pegged as being a couple cards short of a whole deck, had simplified the matter at hand and offered a reasonable solution. Even Papalymo was surprised that he hadn’t thought of it first. Perhaps our Yda wasn’t quite as ditzy as I had once thought? I got started right away with the new plan and approached each Sylph in Little Solace individually and introduced myself with a dance. It was one thing for the Sylph to greet one another by dancing, they could fly for one and they looked far more graceful than me. By the time I had danced for the last Sylph I was more worn out than I’ve been after most battles I’ve been in. I returned to Yda and Papalymo, and despite my efforts Komuxio was still hesitant to speak with us. Papalymo suggest that perhaps I lend some sort of aid to the Sylph, that helping them with their problems would go further in earning their trust. I spoke to one of the non-Sylph residents of Little Solace to see if she could enlighten me to the troubles the Sylph might be having. The woman informed me that the Sylph were in constant fear of being attacked by aggressive monsters in the forest. I may not be a good dancer, but I was good at slaying monsters. I set out into the thicker woods around Little Solace and spent the afternoon slaying as many monsters as I could find. While out on my hunt I had come across a number of brownie bushes and thought perhaps the Sylph would appreciate them as another offering. With countless monsters slain and brownie bushes collected, I returned back to Little Solace to speak with Komuxio once more. Komuxio was clearly beginning to warm up to me, but I had a feeling that he was hiding something. I asked him what the problem was and he informed me that while I was gone there were sightings of unfamiliar walking ones, I mean, unfamiliar people, in the forest. I knew that if I wanted to speak to the Sylph Elder I’d need to assure Komuxio that nothing was wrong and so I began to speak to the residents of Little Solace. However, the more I spoke to the inhabitants the more it sounded like the Sylph were describing Garlean troops. I journeyed out into the woods once more in search of evidence that Garleans were out and about. As evening drew near and the spotty sunlight of the forest began to wane I stumbled upon a supply cache that had been cleverly hidden. Having learned my lessons, I summoned a Carbuncle familiar before moving in closer to investigate. Just as I began searching through the first crate two Garlean soldiers stepped out of the woods and spotted me. My familiar dashed after one who fled for reinforcements and I lobbed magic at the one who remained until he fell. I knew that if my familiar strayed too far from me the magic keeping its physical form intact would dissipate, so I quickly returned to the supply cache. I found what looked like a quartermaster’s log and decided that it and the Garleans who had attacked me was all the evidence I needed. I quickly returned to Little Solace and offered the supply log to Komuxio. As we looked over the log we discovered that it had detailed information concerning the Black Shroud and supplies one would need for a prolonged encampment in the forest. I found this log troubling. This information was extremely detailed and could only have been written by someone with extensive knowledge of the forest. It was solid proof that there was a traitor amongst the Gridanians. I felt that this information was important and needed to be delivered to the Adder’s Nest immediately, even if it meant traveling the forest at night. I had just thrown the last of my things into my pack and told Yda and Papalymo what I had learned when Komuxio approached me quickly. He spoke fast, deeply worried, and I managed to surmise that his friend Claxio was out in the forest alone. The Sylph had been last seen heading toward an area of the woods patrolled by Tempered Sylph, Sylph that had become thralls of Ramuh. I looked to Yda and Papalymo for assistance, not knowing whether I should go to Gridania as I had intended or search for Komuxio’s lost friend. The safety of Gridania was at stake, but so was the growing relations with the Sylph. I found myself at a loss, caught between these two duties. How quickly could the Garlean forces mobilize and what other information had been leaked? And if I ignored Komuxio’s pleas for help would the Sylph ever trust us again? I closed my eyes and took a deep breath. I’d just follow my gut instinct, whatever the consequences. I am really hitting the point where if I want proper images to go with these entries, I need to get them myself. What do you mean no one took a screenshot of Garlean Soldiers in the East Shroud? At least google image search has been pretty good at getting me nice, people-less, shots of camps and such. Kudos to whoever managed to snag all of those, by the way. So this ended up being another part of the game that took a whole lot longer than it did to write. This is also pretty much the point where everyone on the early access weekend got stuck because the servers overloaded and the Duty Finder broke. With the Duty Finder down, no one could enter the next instance, or any for that matter, and there were quite a few hours spent just bumming around doing whatever instead of actually being able to progress or run dungeons. Boy, wasn't that 90K and 1017 and 3102 a mess? But things got cleared up in the end like everyone said they would. You'd have thought the sky was falling. Oh, wait. The Sylph are an extremely silly beastmen tribe, the way they talk and, seriously, dancing as a form of greeting? Ok. Thanks for making me run around and dance for a billion Sylph (eight, really). This story arc is also where it starts grasping for ways of making you waste more time running around doing oddball errands than actually solving the problem at hand, but it all somehow comes full circle in the end. Like I said, whoever wrote the missions had a really good grasp on how to make even the strangest request weave into the whole in the end. The next entry should hopefully get us through the rest of the running around quests, tie up the loose ends, and then the entry after will be the next dungeon, The Thousand Maws of Toto-Rak. Please look forward to it!